A motorist who filmed himself driving at speeds close to 125mph on a motorway and then posted the footage on the internet is being sought by police. 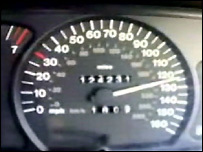 The three-minute film shows the driver pushing a three-litre car to its limit on the M23 in Sussex. The clip was posted on the YouTube website by "paulscav". In a statement, YouTube said it would give details to police if asked, but under its rules it was not considered offensive and it would not be removed. 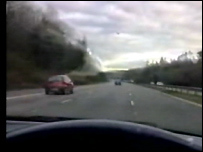 During the clip the driver films his speedometer and then the view from his vehicle as it races down the outside lane of a stretch of the M23 lined by conifer trees. Motorists are seen to move out of the way as the car reaches speeds of up to 125mph. A YouTube spokesman said: "Footage like people driving fast in cars is common place on television, whether in real life programmes or in dramas and films. "So this sort of content is not only found on the internet. "Of course, if there is any illegal activity taking place or if the police think that a video may be evidence of a crime, then we encourage the police to get in touch with us under the laws the government introduced for disclosure of data." Sussex Police have warned that anyone filming such activity could themselves be caught on camera and taken to court. Sgt Richard Hornsey said: "Our videos are better quality as well for the jury and the judge. "I'd urge the public to report incidences of poor driving - let us know about it because we will take them seriously and investigate them." The video has prompted the RAC Foundation to renew calls for website operators to remove clips that glorify speeding on public roads. Head of campaigns Sheila Rainger said it was very worried by the "growth of this phenomenon". "The footage is very irresponsible... it ought to come down." She added that the internet was giving boy racers a worldwide audience and encouraging "impressionable and foolish people to try to follow suit and try and go one better". "We think it's got to be nipped in the bud before we see even more accidents," Ms Rainger said.